If you are a visitor to the "Buckeye State" state Ohio, plan a unique ghost-hunting adventure and stay at one of Ohio's haunted hotels. And if you are a resident of Ohio, get to know your state's spookier side and embark on an exploration of the unexplainable and visit a few of Ohio's very own haunted hotels. For example, don't let the fairytale-ish name of The Golden Lamb Inn located Lebanon fool ya! It is home to not one but TWO resident ghosts! 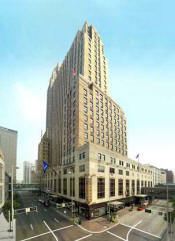 If you ever happen upon the sweet little town, er, city of Cincinnati (aka: Porkopolis), please do stay at its Hilton Netherland Plaza and you might catch a glimpse of The Lady in Green - not to be mistaken for a flying pink pig - the cherished symbol of the city of Cincinnati. Legend has it that a ghost they call The Lady in Green haunts the halls at the Netherland Plaza. The Lady in Green is a sad, story of a wife’s eternal allegiance to her husband prematurely killed in an accident. 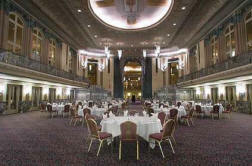 She is said to walk the Hall of Mirrors (below) and the Mezzanine level of the Netherland Plaza. Several construction workers have reported seeing her during the hotel's 1983 renovation. But, her story really dates all the way back to 1930, when her husband, a hotel laborer, was killed in the construction of the hotel that year. His body was never found and his wife, The Lady in Green continues to search for him in the afterlife. Flying Pig & Cincinnati - Why? The historic and charming Golden Lamb Inn, located in Lebanon (NE of Cincinnati) was founded in 1803 which makes it Ohio’s oldest inn. It has been visited by many famous people such as Charles Dickens, Mark Twain, Harriet Beecher Stowe, Henry Clay and twelve presidents! Each one of their rooms is named after one of its famous guests. You will also find there is one room named Sarah, who happens to be one of The Golden Lamb’s resident ghosts. There is rumored to be two ghosts at The Golden Lamb. One of them is the aforementioned Sarah, who was the young niece of the Inn’s manager at the time, Isaac Stubbs. Oddly, since the ghost seems to be of a young girl, the real Sarah actually grew up to a ripe old age. We are not sure why it is thought to be Sarah’s ghost. Some think it can be another child, while speculate that it is the ghost of a girl named Eliza Clay, daughter of Henry Clay. Eliza had died in the hotel from a high fever in 1825. Perhaps we will never know for certain whom the ghost really is. However, the ghostly activity is mainly located in Sarah’s Room. The ghost appears as a young girl in a white nightgown and has been known to knock pictures off the walls and make noise and feet stomping. The second ghost of the Golden Lamb is believed to be Charles R. Sherman, an Ohio Supreme Court Justice who died at the inn in 1829. The ghost is described as a "gaunt, gray man" who appears in the hallways. You can even smell his cigar smoke, although the Golden Lamb is a non-smoking establishment. 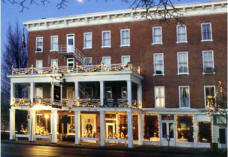 “Sarah's room is located on the fourth floor of Ohio's Oldest Inn. Sarah Stubbs was the daughter of Albert and Eunice Stubbs. 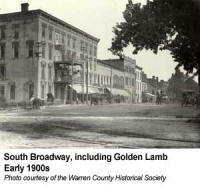 When Albert died, Eunice and her children moved to The Golden Lamb where Isaac Stubbs Jr. (Sarah's uncle) was the manager. Sarah grew to be an adult, but some say her ghost remains in the building.